You know that feeling of excitement kids get when Christmas approaches? The gifts, the music, and so on. And the thoughts of so many people, “What am I going to get so-and-so for Christmas?” I know the feeling. When kids’ birthdays approach, they probably get excited about that as well and even wonder, “What am I going to get for my birthday?” But for some, it’s more a question of “will anyone remember my birthday?” Do you know that feeling? But you know what? You get older. You survive. And you celebrate in your own way. You eventually might even realize you’re not alone. Today is my birthday, and having it so near Christmas used to be not so great, but it’s really not too bad now, even as I look back. Depending on a birthday’s proximity to Christmas, work/school could be a non-issue. Other kids aren’t so lucky; after all, birthdays don’t get most people out of work/school for a day. Now that I’m older, I’d rather be working on my birthday than be unemployed (though being off would be nice occasionally). You know what else? 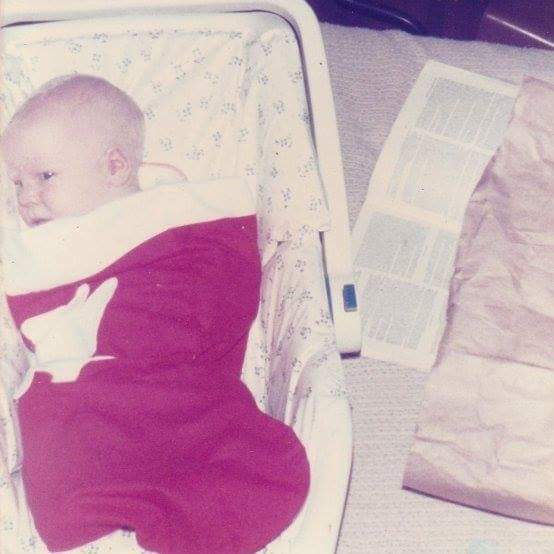 I got to come home from the hospital for the first time in a stocking. One I still have. Now that’s pretty special. I’m sure there are other reasons to enjoy today for what it is, my birthday being so close to Christmas. I may not even try to celebrate the way I used to as a kid anyway, but I still enjoy having my birthday, even if I don’t do much with it. Not to mention, there aren’t really any material possessions I want so badly, and I find it more fun to give gifts than receive them. So if your birthday is close to Christmas, I know how you feel (unless your birthday is on Christmas, which I don’t). It stinks as a kid to be so overshadowed by such a monumental holiday, but it will be okay. Just hang in there.